While the lower-tier prices seem affordable for 1 to 3 users, once you get into it, you’ll soon find that many of Hootsuite’s value-added features are in the very expensive top-tier plans. However, if you’re a larger agency, and you need to manage lots of different networks, apps, and integrations, it’s a versatile tool, with excellent collaboration and reporting features, which will save you and your team time. 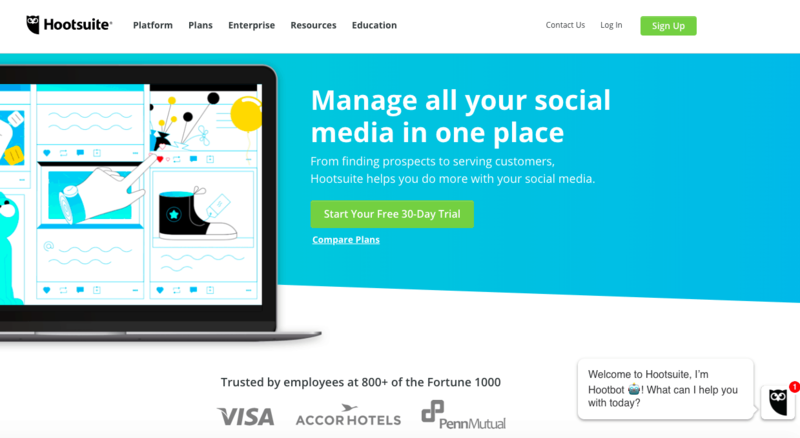 Founded in 2008, Vancouver-based Hootsuite is synonymous with social media management. With more than 16 million users and 1,000 employees, it’s the leading social media management tool on the market today. Unlike Buffer, Hootsuite is an all-in-one solution, which works with all of the major social media platforms (Twitter, Facebook groups, Facebook pages, LinkedIn profiles, LinkedIn pages, Instagram, YouTube and Pinterest), as well as many more via the Hootsuite App Directory. Unless you go for an Enterprise plan, the maximum number of users is 10, with a total of 35 connected social profiles. I’ll warn you now, the plans can get pricey, but there is a 30-day free trial to help you get started. Over the years it’s taken on millions of dollars of funding, so it’s surprising to know the dashboard’s often called “clunky” or “outdated” by industry experts and existing customers. For many, Hootsuite is the only social media management tool worth mentioning. But with the rise of robust competitors (e.g. Sendible, Buffer, or Sprout Social), has Hootsuite had its day? This review is designed to dig into the data; the features, ease of use, analytics and reporting, customer service, and more to find out if Hootsuite is right for you. 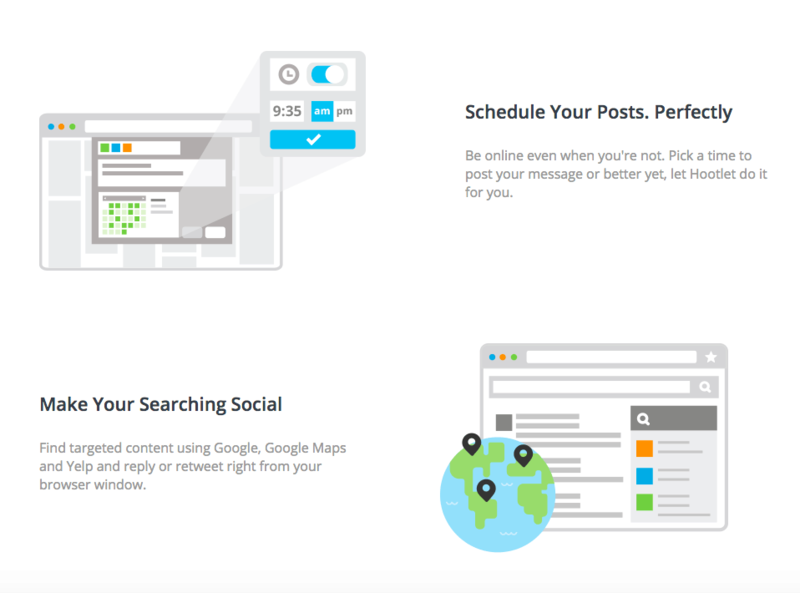 Is it possible to track and manage all your social media interaction in one place? How many scheduled posts are possible? Is it possible to see which team members are viewing and replying to comments and messages? Is the analytics dashboard easy to navigate to and understand? How easy is it to create a new account and connect your social media assets? By the end of the review, you’ll know whether Hootsuite is a good fit for your business needs, whether you’re a solopreneur, an agency, or an SMB. Can Hootsuite keep up with the ever-changing social media platforms? An all-in-one solution, it offers a range of features from social media security features to a shared content library and even Hootsuite ads, which allows you to manage your search and social campaigns in one spot. The question is, has Hootsuite evolved in line with social media and do the features meet the needs of tech-savvy agencies and business today? Or is it out-of-date, like it’s arguably clunky interface? Only available to customers in the Professional, Team, Business, and Enterprise level plans (controversially not legacy Pro and free users), Hootsuite’s Inbox (beta) supports Facebook Page private messages, Twitter direct messages, and comments and replies on your LinkedIn Page and Showcase Page posts. It features all conversations (both private and public) and you can choose from three actions: reply, assign, or dismiss. You can also sort (change date order), filter (by social networks), or change the inbox view (see assigned, unassigned, or done messages). Most people would agree that the addition of the Hootsuite Inbox is beneficial. Unfortunately, when it was released, access to Twitter DMs was removed from the free plan and made only available in the Inbox, which forced many users to reluctantly upgrade to get the feature. Social listening in Hootsuite is handled by “streams” of social content, organised in tabs, which can then be filtered by keyword, hashtag, and location, in multiple languages. When a post, tweet, or comment mentions your keywords, you can reply or you can assign it to a team member. 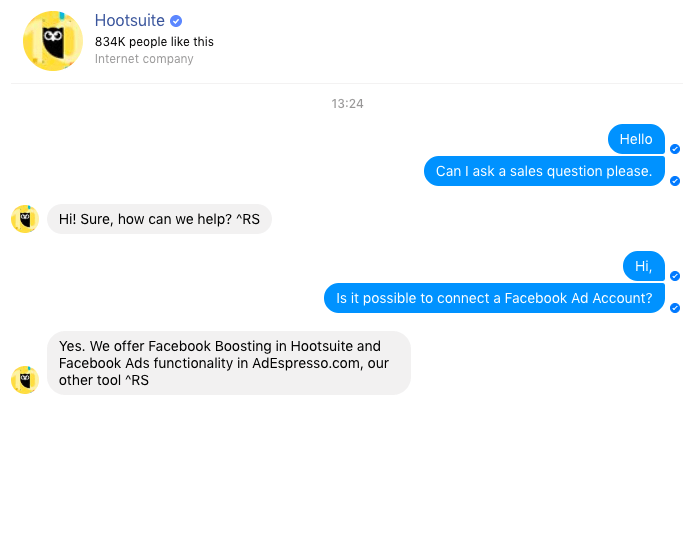 Hootsuite lets you monitor any of your connected social media accounts or use one of the many integrations with monitoring apps, so you can track review websites or the general tone of your brand online. While Hootsuite streams are one of its strong features, it could be improved. The design could be cleaner, and sometimes it can get a bit slow and buggy, plus you need to exercise patience to get your streams set up correctly. It is worth doing, as it allows users to divide engagement activity into social networks and streams, offering an all-in-one interface. 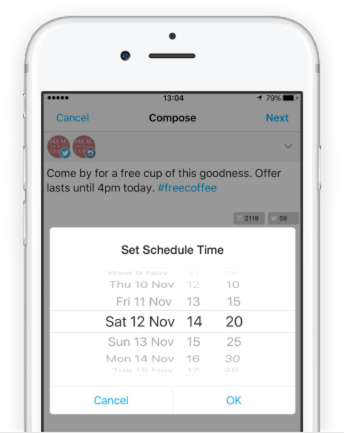 Hootsuite does allow you to schedule posts manually (by selecting a date and time when you compose the message) or automatically (based on optimal times to post). You can also view and edit your messages easily via a list view or calendar view. This is all great functionality, but there are a few limitations. For instance, you cannot pause bulk posts (a lengthy workaround would be to export them, delete them, then re-upload), nor can you move a post back to draft from scheduled or publish a scheduled post now. If you need Pinterest scheduling, this isn’t available either. You’ll need to upgrade to one of the top tier plans, but the team collaboration features are pretty substantial. First, Hootsuite allows your team members to view your (or your clients) social media activity without the need to share individual login details. Second, as well as the default approval workflows (messages by team members need to be approved by an Admin or Editor for the specific social network), you can also set up custom approval workflows (e.g. designate a specific team or team member as the approver or add a second or third tier of approval). It’s also possible to set permission levels for individual users and accounts and, finally, it’s easy to create tasks and assign them to team members, as well as delegate replies, tweets, mark as done, track messages, and so on. The caveat with team features is the price. To benefit from any collaboration tools, you’ll need to upgrade to the Team plan, while to get most of the important ones, you’ll need to upgrade even further into the Business plan. Hootlet is an extension which allows you to share content you find while browsing the web. It’s not particularly unique to Hootsuite (Sendible has a similar feature), but it’s useful functionality, allowing you to share content immediately, as well scheduling posts for a later date. It’s not technically a feature, but perhaps the most important part of Hootsuite is how comprehensive it is. While newer companies like Sendible and Buffer are catching up, it’s hard to find a competitor that offers such a complete social media management tool. Hootsuite connects with all the usual social media accounts, plus countless others via the use of third-party apps and integrations. It also includes all the features you’d expect in an all-in-one solution, including posting and scheduling, analytics and reporting, engagement, and listening. 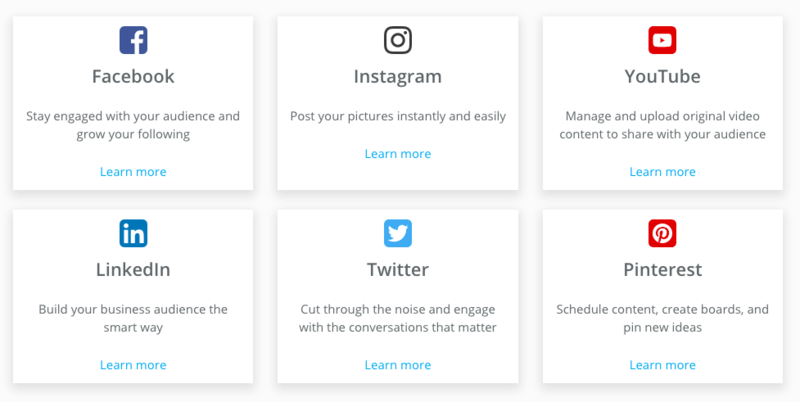 All these features and integrations come at the expense of simplicity (and price), so you I’d only recommend Hootsuite to companies with complex social media management requirements. Otherwise, the learning curve and added complexity are unnecessary. Outdated, clunky, or surprisingly attractive? After reading numerous negative reviews about Hootsuite’s admin design, I was pleasantly surprised after I created an account. The interface is relatively modern and clean, especially when you consider the number of features packed into one tool. The dashboard is divided into tabs and each tab contains streams which are designed to monitor different information and activity. You can either leave the tabs and streams in their default settings, or you can customise to meet your needs. Overall, getting set up only took a few minutes and the process was beginner-friendly. I think that how much you enjoy the interface is going to depend on your opinion of the “blockish” layout of the tabs and streams. You can create a content library which can be shared, by building a stream of content with a certain hashtag, location, or keyword. Also, the Hootlet app allows you to add to the library while you browse the web. Plus, with the approval feature, you can ensure that nothing goes live without the correct approval. 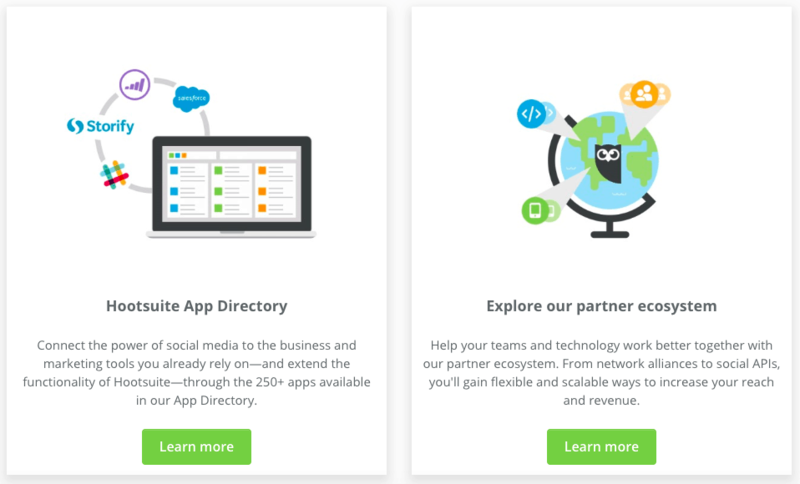 Hootsuite’s app directory is a resource containing hundreds of extensions and integrations by third-party developers. This means you can customise your dashboard and Hootsuite functions to meet your business needs. While lots of the apps are free, some do come with a monthly fee, which may start to add up (on top of the already expensive base plan). Apps include review website trackers, form builders, and project management tools, for example. 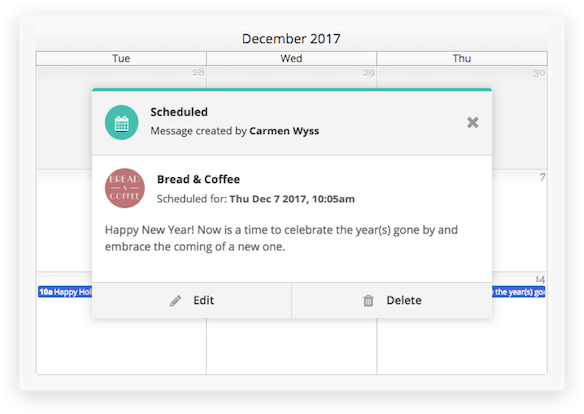 The Planner is Hootsuite’s calendar view. It’s an easy-to-use, visual way to plan your future content schedule. You can view, edit, and schedule posts with just a few clicks. There are a couple of limitations, though. You can only see posts created on Hootsuite in the calendar, which is an issue if you use two tools for scheduling. There is also a more minor issue, that you can only see weekly views and not monthly. Hootsuite’s analytics and reports have undergone a design overhaul. The results are good and the interface is now user-friendly. Unfortunately, many of the best features are reserved for the top tier plans, so unless you’ve got a big budget, you’re probably not going to benefit from them. Hootsuite’s analytics dashboard is surprisingly clean, modern, and user-friendly. It’s suitable for beginners, as the data is automatically pulled from any social media accounts you’ve already connected. The navigation is straightforward, as you select which social media account you’d like to review or choose an overview report combining social media channels. Interestingly, you need to upgrade to a Team plan or above to get Post Performance reports. The reports are easy to create. You can choose from a series of templates (Facebook, Twitter, Linkedin, Instagram, or a Mixed overview) or create a completely custom report. When you’re ready, you can export the report to PDF, PPT, or if you upgrade, to Excel or CSV as well. 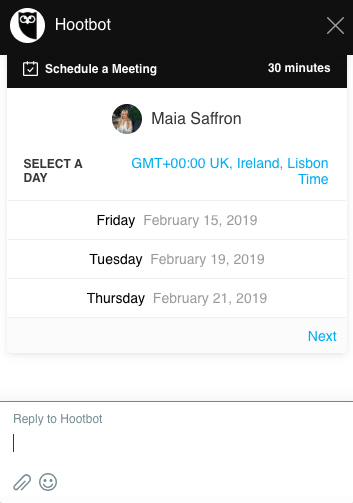 You can schedule reports to be emailed on a weekly or monthly basis (you can’t set the exact date), however, you can only send them to users in the Hootsuite account. While you can obviously forward it on, some other tools let you set up automatic reports for clients, which is clearly a timesaver. Hootsuite’s analytics feature integrates with the data in all of your connected social media accounts. However, the data you can view depends which Hootsuite package you’ve signed up for. All accounts come with Twitter, Facebook Page, Instagram, and LinkedIn Page metrics, with Team metrics available to Enterprise team admins, Insights metrics (available to Enterprise users with Insights accounts, and Amplify metrics (available to Enterprise Amplify admins. Read more about my experience with Hootsuite analytics. Hootsuite offers a variety of help documents and tutorials, which often include videos, as well as a series of FAQs. There’s even a Hootsuite Academy, with courses and certificates on Hootsuite plus broader social media topics. If you need direct support, channels include live chat, Facebook messenger, email, and Twitter, although (as I’ll explain below) these all come with their nuances. Support, regardless of the channel, is available 24/7. Facebook is by far the easiest way I found to get in touch with Hootsuite. I sent them a message at around 1:30 PM on a weekday and I received a reply within 90 minutes. The operator was helpful and polite, answering my question in full. If you try to contact the team via live chat on the main website, you are greeted by a bot. Personally, I love bots (I’ve used them a lot for lead generation purposes). However, when I asked a technical support question, the bot ignored this and provided no option other than to schedule a meeting with a member of the sales team. Usually, there’s the option to override these settings to chat with a human, so I found the whole interaction a bit frustrating. I was later sent a series of automated emails asking me to continue booking a sales appointment. After my unsuccessful live chat experience, I sent a message via the Contact Sales form on the contact page. I sent the email at 1:30 PM U.K. time on a weekday and the reply came around 15 hours later. The operator was helpful and answered my question in full. There are three main plans, plus a custom plan for Enterprise customers with higher user requirements. The cheapest plan, Professional, comes with 1 user and 10 social profiles, Team has 3 users and 20 social profiles, while the most expensive Business plan comes with up to 10 users and 35 social profiles. While the base plan is affordable, it’s probably not going to provide enough features for even beginner users. For instance, most of the analytics and reports are only included in the pricey Business plan, with a few options available in Team. You can only pay by credit card (Visa, Mastercard, American Express, JCB) or PayPal. There’s a 30-day free trial on all plans, so you can get in and test out the dashboard. 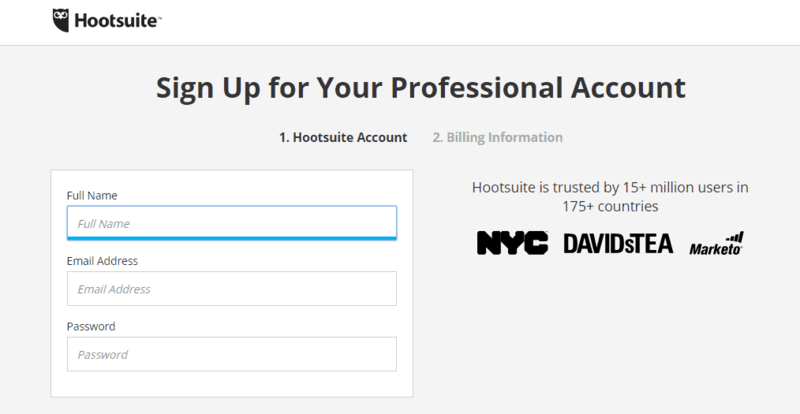 I created an account with Hootsuite – but as there’s a 30-day free trial, I was not billed and couldn’t test the refund policy. I tested the cancellation process nevertheless and found it was straightforward and could be done 100% via the admin. 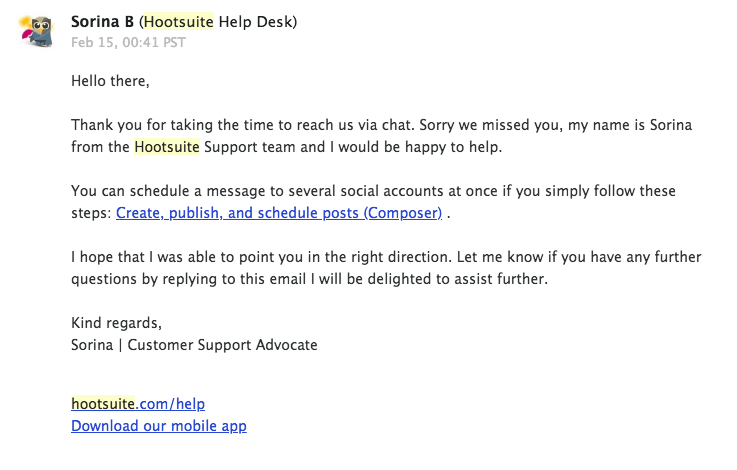 Read more about my experience cancelling my Hootsuite account. Would I recommend Hootsuite? It depends. If you’re a smaller company with less complex needs, I’d recommend reviewing Sendible or Buffer. While the lower-tier Hootsuite prices appear affordable for 1 to 3 users, once you get into it, you’ll soon find that many of the value-added features are only available in the very expensive top-tier plans. However, if you’re a larger agency, and you need to manage lots of different networks, apps, and integrations, then Hootsuite could be a good fit for you. It’s a very versatile tool, with excellent collaboration and reporting features, which will save you and your team time and money in the long run.